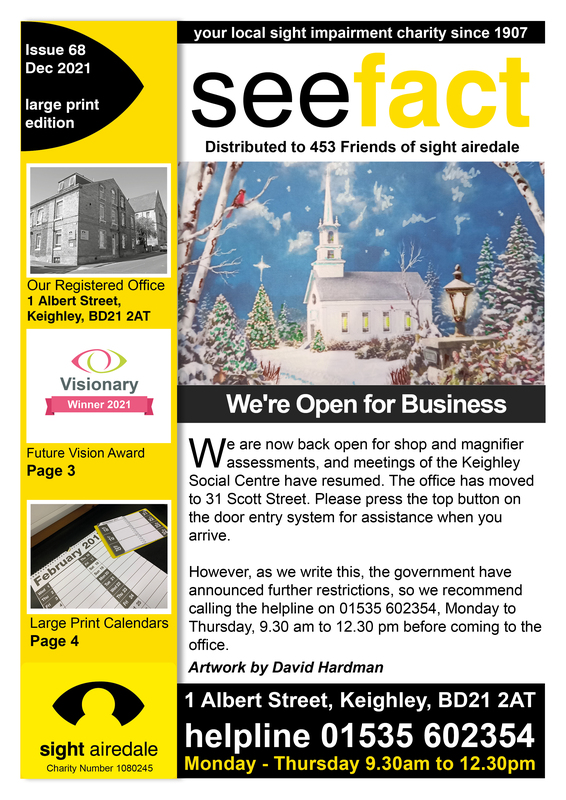 seefact is published three times a year and is sent free to all Registered Friends of sight airedale. The magzine is available in large print, Braille, Audio (CD and Cassette), memory stick, email, Ebook (Kindle, Mobi, iPad and ePub). Want to be amongst the first to hear our latest news, then why not sign up for our E-Bulletin. This email newsletter will let you know when our website is updated and remind you of any up comming events. At the Annual Conference of The National Association of Local Societies for the Visually Impaired (NALSVI) for 2006 held in Chester, the seefact newsletter picked up two national awards. A second place certificate for presentation and a second place certificate for content. As a small local Charity the news team are delighted to receive these prestigious awards.